Some projects just seem never-ending. 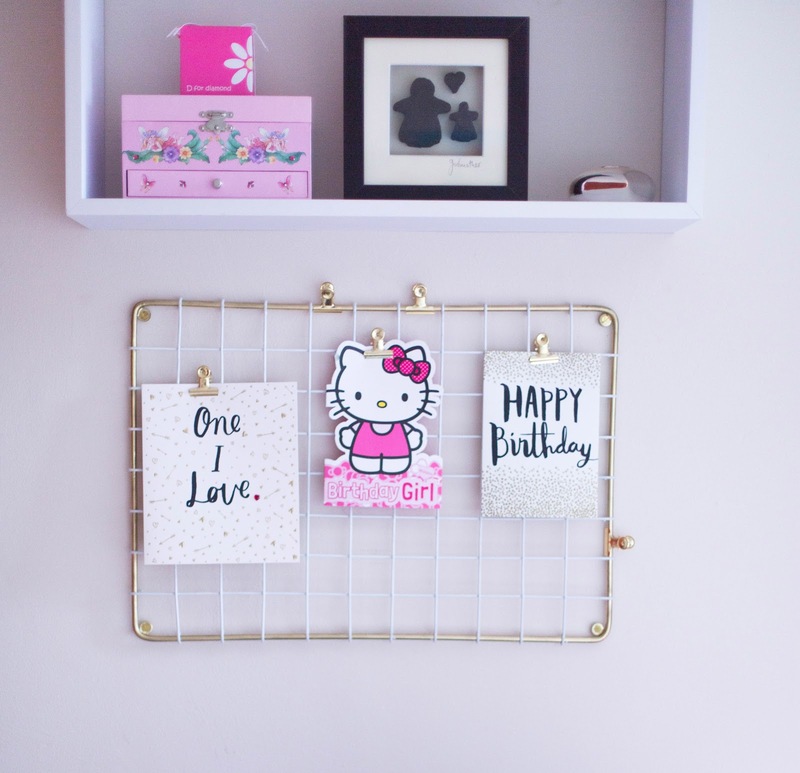 I've got to admit, I started writing this post over a year ago, actually almost two years ago, but half way through decorating I changed my mind and got distracted. Does that happen to anyone else? My daughters bedroom make-over is kind of finished now. I don't really like to use the term 'finished' when it comes to decorating, but at least I'm pretty happy with the outcome now. In case you are wondering, this used to be our second guest room. You can see the before pictures here. So, over a year ago we decided to move my eldest daughter to her own room. 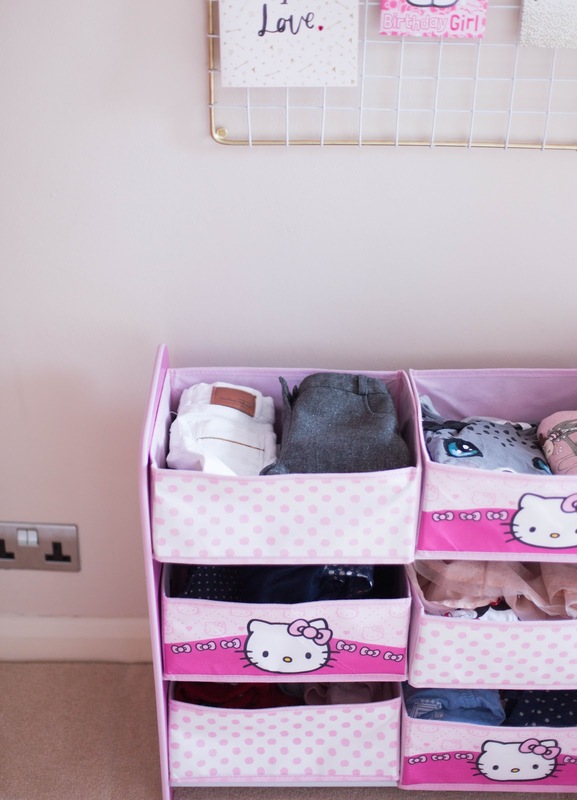 Her sister was arriving and I needed the nursery ready for her. Luckily my daughters new room was much bigger than her old one. She didn't seem to mind the change. Actually she was pretty ecstatic! 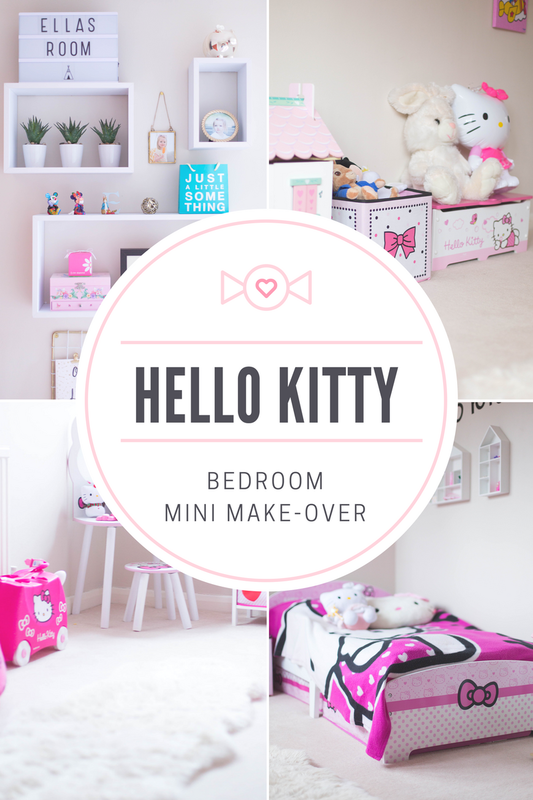 It did help that we decided to go for a Hello Kitty themed bedroom. 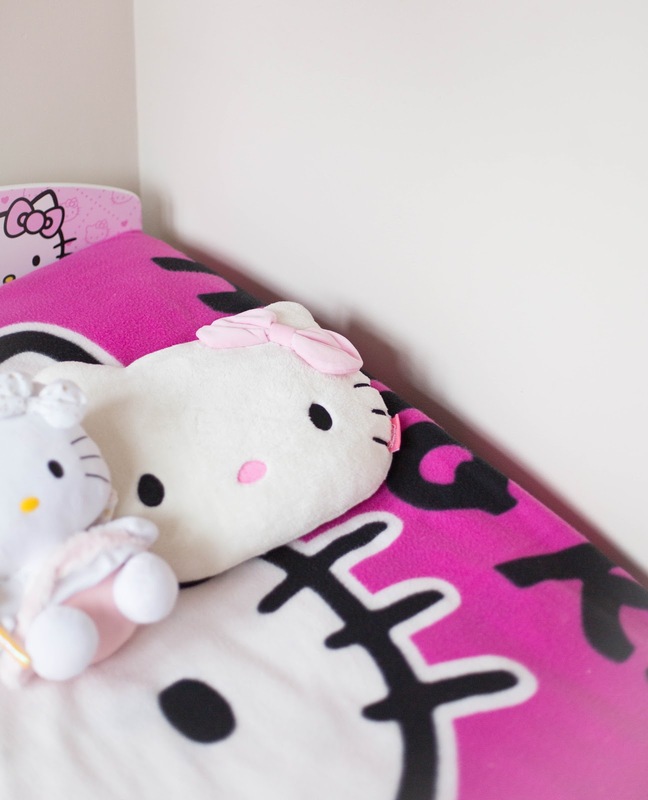 She has been obsessed with Hello Kitty as long as I can remember.. And luckily that is still true today. 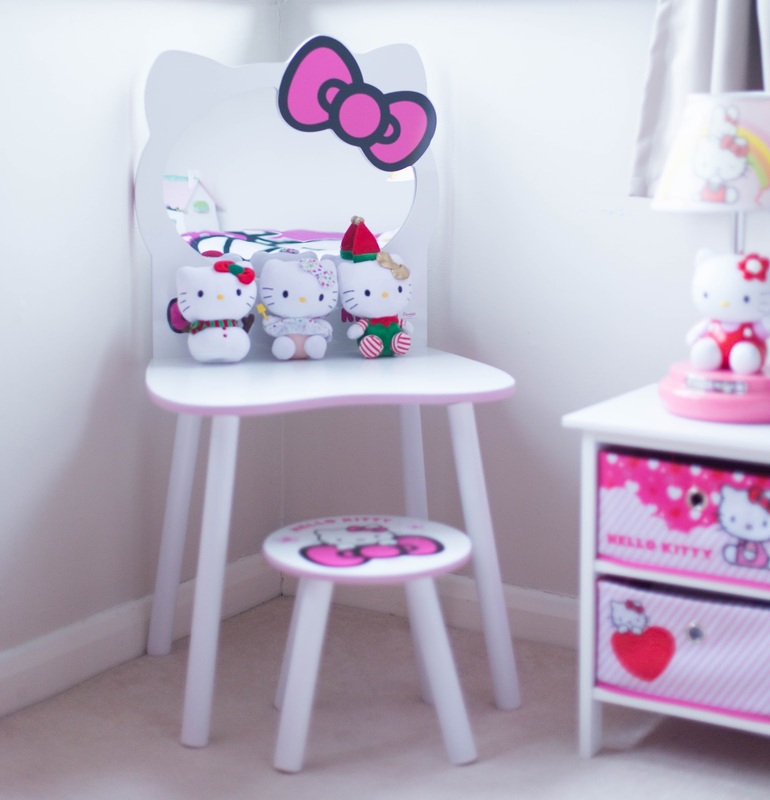 We bought most of our Hello Kitty furniture from Amazon and ebay. I loved how minimalist the furniture looked compared to everything else I had seen. I wanted to keep the decor quite neutral with a dash of pink. I thought the white furniture looked great with the beige walls and the matching carpet. We didn't want to paint the room again, so it was ideal to leave it the way it was. 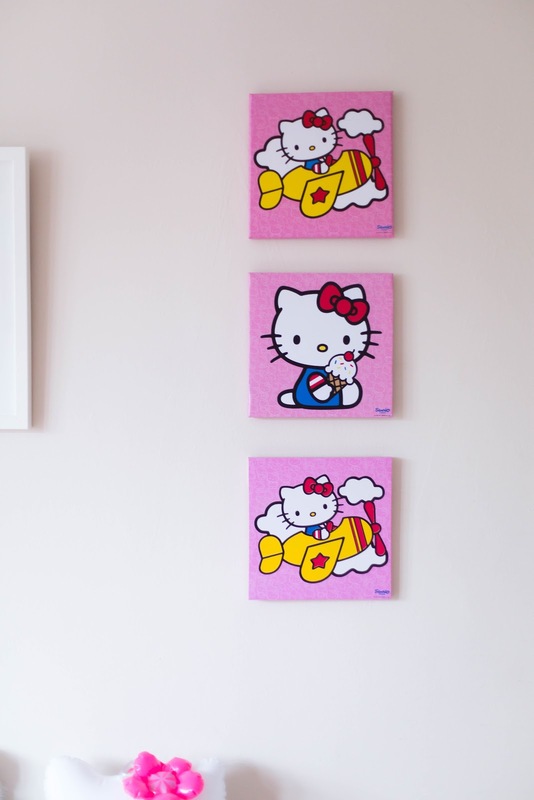 You can find quite a few Hello Kitty accessories in the UK, but it's nothing compared to some of the amazing bespoke pieces they have in Japan and in the US. I was drooling over them on pinterest but ordering furniture from overseas is simply not worth it. The shipping and taxes quickly double the price. By the way, all the furniture came flat packed. I was a little worried how they would hold up but so far we've only had one incident. One of the boards on the bed broke and that was due to two kids rigorously jumping on it! The H&M wall shelves above the bed are great for play, but not ideal for storing larger items. 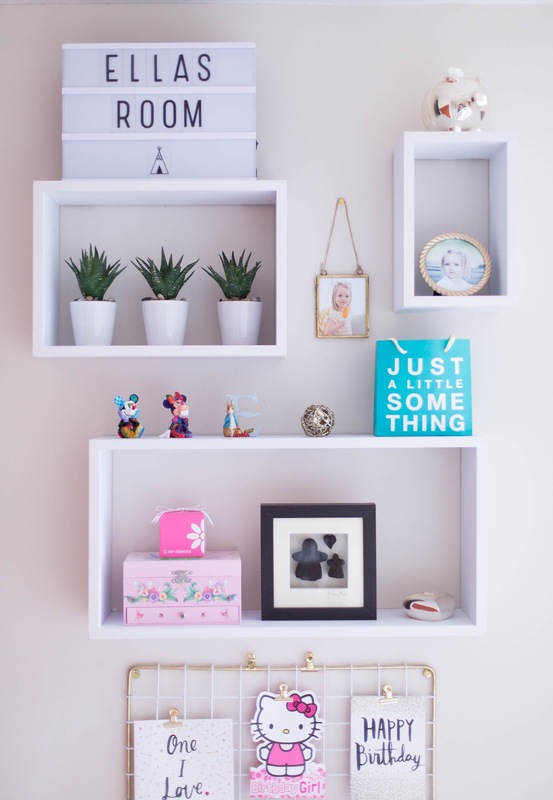 The Trible Cube Shelving is fantastic for storing any larger or heavier accessories. Or, simply things that you don't want your children to play with (keep sakes etc). I couldn't help adding a few gold accessories to the room. Faux plants are also great for bedrooms because you don't have to worry about keeping them alive. My most recent purchase is the Ethereal Notice Board from Sainsbury's. I saw it in the SS17 Press Show and knew straight away it would be perfect for my daughters room. You can use it for notes, cards or to showcase school art. It's such a good value at £14 that I'm thinking about getting one for my youngest daughters room too! Although we've got plenty of storage, I don't think it's quite enough. There are just too many toys and clothes lying around by the end of the day. 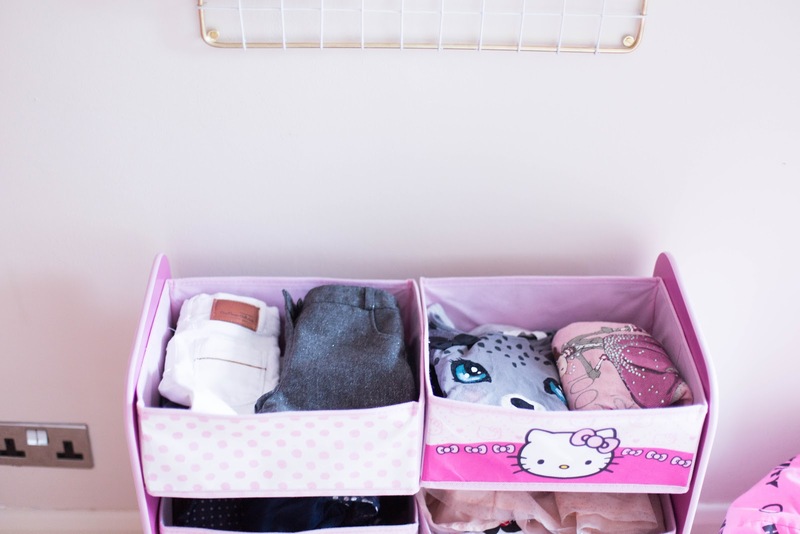 Children's storage boxes can be a bit small which is why I like to use pretty laundry bags as well. I guess the real issue is getting them to actually tidy up. Our daughter is pretty good at it now but the problem is her 1 year old sister. She loves to play in her sisters bedroom and she can literally destroy the space within seconds. I cannot wait for them to play together nicely but we're not there yet. Hopefully it won't be too long though! I couldn't make up my mind about the walls. I guess that's why this make-over took so long in the first place. First I bought some wall stickers, but then I decided they didn't look right. I think there were too many of them and it made the room look a bit cheap. 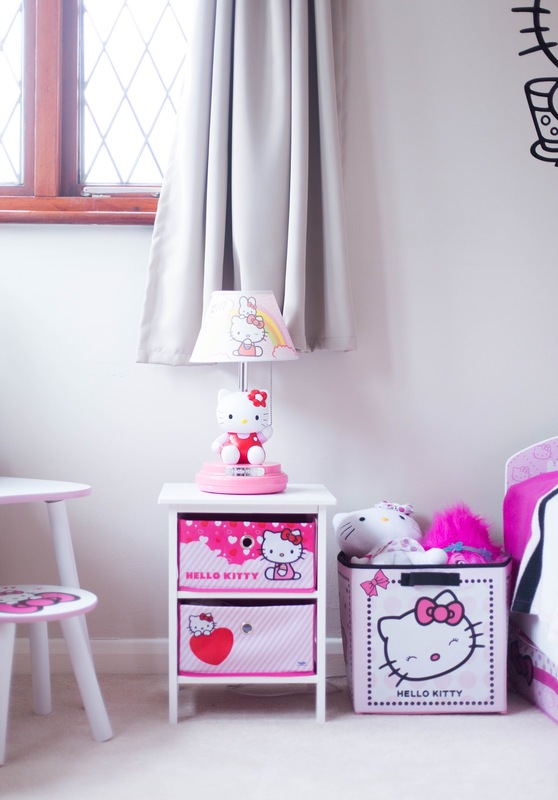 I loved the Personalised Hello Kitty decal though which we decided to keep. 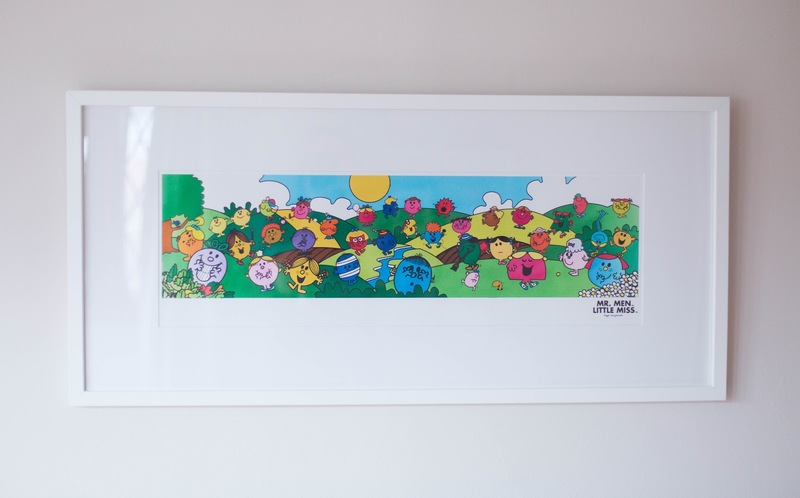 I also got some Hello Kitty wall art and a large Mr Men/Little Miss framed art by Roger Hargreaves. John Lewis used to stock it but I cannot find it online anymore. It wasn't exactly part of the theme, but I love it. I think it looks very original. 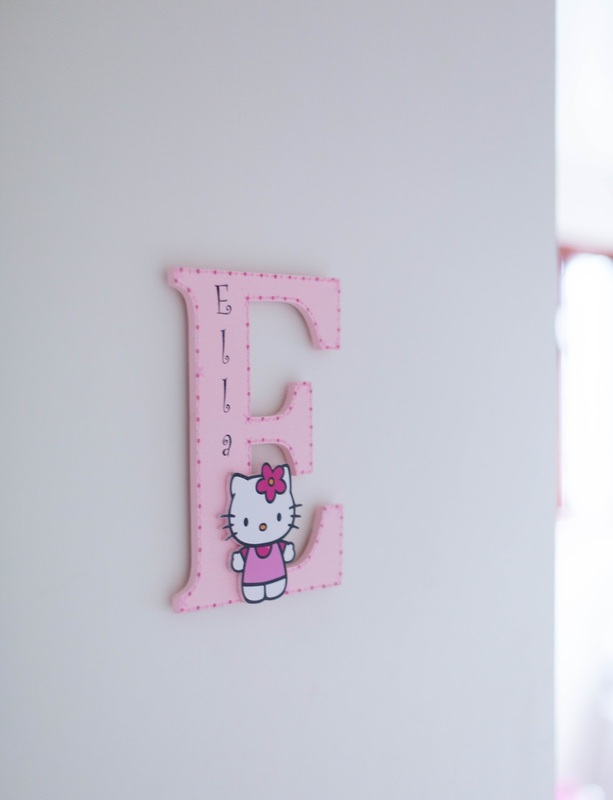 The personalised Hello Kitty door sign is from ebay. We've got a similar one for my youngest daughter's door as well. They are hand-made and look just too cute. I couldn't locate the same design on ebay anymore. There are lots of similar ones out there though! This room was definitely decorated on a budget and I think we did well. Would you believe it cost about 300 pounds to furnish the entire room (excluding the wall art)? It really helped that we bought most of the furniture from Amazon and ebay. I shopped around and took my time. 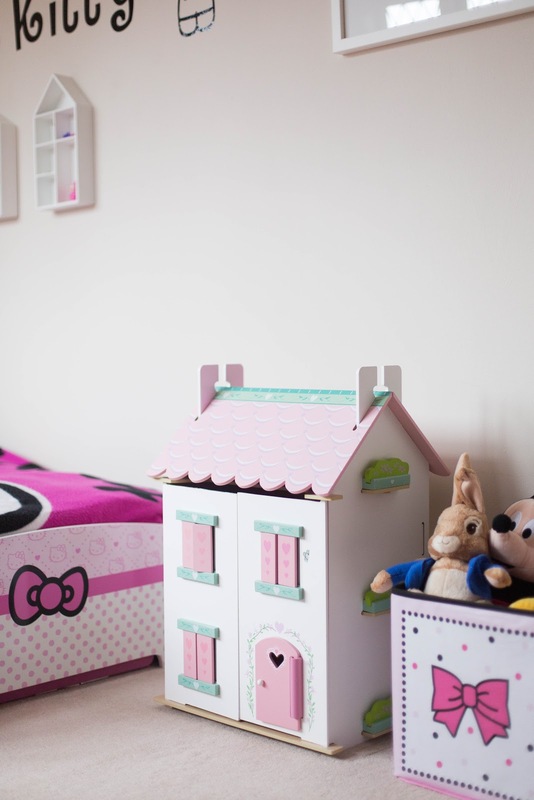 What's your take on kids bedrooms? Would you go modern or kiddy? I guess you can do both these days. PS. I almost forgot. It's important to measure absolutely everything (both the furniture and the accessories) so that they will fit in the space intended. I was a little worried when the furniture arrived - it looked so small! But, once we had everything in place it turned out just as I had planned. seriously, every part of this room makeover is gorgeous!! 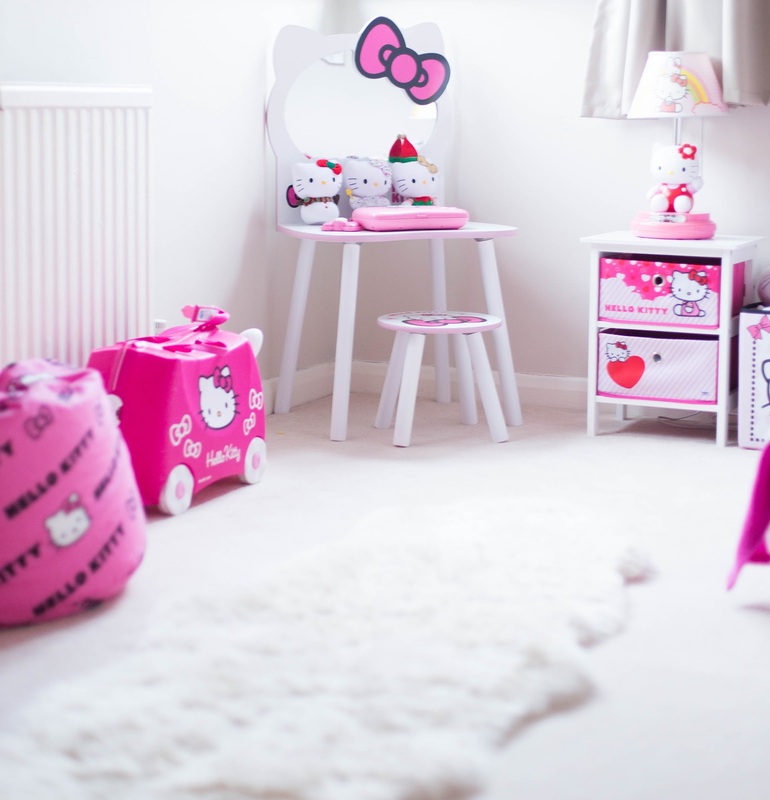 I think kids room should be whatever they want them to be - so in general kiddy wins for me! Getting kids room like this is necessary it bring positive vibes and offer a natural healthy mentality, thus kids become progressive in their life. Thank you for your comment Steven!